Please get in contact for information on revolutionary new yeast strains that can produce lager / pilnser style beers at room temperature in as little as 3 weeks. Prices include VAT at 23%. This system is based on 48 weeks, and 5 brews per week. You can of course brew less frequently, and brew less beer. The key advantage of this system is repeatability, especially when used with whole grains, hop pellets and dried yeasts. Repeatability is hard to achieve with other systems, and its very important since brewers strive to produce beers with consistent colour and flavour. Another big advantage is that all Speidel solutions are automated; this means that you should be able to perform all the peripheral brewing tasks during the 5 hour brewing cycle including bottling/kegging, cleaning fermenters and kegs, sterilizing bottles/kegs, etc. 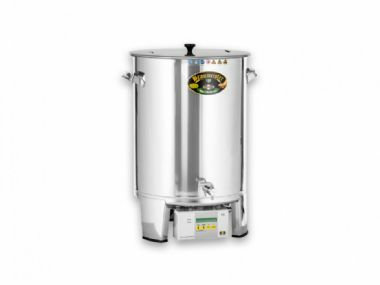 This is ideal for the microbrewer who wants to test the water without investing a fortune in equipment. You can subsequently scale all the way up to 300,000 litres or more per year. You can used crushed grain, but it tends to lose character if stored, and its hard to know how fresh it is when it arrives from your supplier. This is why we strongly recommend using whole grain, and crushing it just before brewing; this will yield fresh grain every time. The grain mill included is perfect, especially when attached to a drill. Hop pellets are preferred, since they are more stable that leaf hops. Also, dried yeasts are preferred since they tend to be more stable than liquid yeasts which begin to degrade from the day they are manufactured. At the end of the day, its all about producting beers with consistent colour and flavour. This solution does not include kegs, bottles, bottling equipment and cleaning equipment. It does however include 2 bottling buckets, complete with filling sticks. It doesn't contain heating and cooling systems either. Buy a simple drill from any DIY store. We use a cheap battery operated drill and it mills over 2 Kg per minute with a top quality result. Don't mill too fine, or the wort pipe may get clogged. Just enough to break the husks, or a little bit finer. Bear in mind that grain size may vary from type to type (wheat is typically smaller than barley). At 2 Kg per minute, it takes only 2 minutes for a 20 litre batch and 5 minutes for a 50 litre batch. The mill above has mechanically coupled rollers; this is important as this design does not cause lateral stress on the grains which would release tannins and ruin your beer. If you can convince us that you will buy your ingredients from us, then we will provide recipe development consultancy for free. We are developing an ever wider range of recipes for the Irish market, and can supply you with existing recipe packs. Or, if you want something different just let us know and we will brew several variations for you until we get it right! We will then provide it as a recipe pack so that you don't have to store grain or other ingredients. Hot summers can make it difficult to keep fermentation temperatures under control, and specialized cooling systems may be required. These are expensive; ideally a cool room kept at about 18 oC is required and this is possible with air conditioning. From mid September to mid June, you probably won't need cooling systems as long as you can find somewhere cool to ferment your beer, i.e. a downstairs room with the heating turned off. Howerer you will always need heating systems. Its very important to keep your fermenters at a constant temperature since fluctuations can cause nasty flavors in the beer. The simplest solution is to find a room that is always a few degrees cooler than the desired fermentation temperature and then use controlled heating to achive the correct temperature. This can be as simple as a timer and a brewbelt per fermenter, but a much better solution is to use PID controllers which will keep fermentation temps within a 0.1 oC range. These are surprisingly cheap, and we can supply them but we can't wire them up for you because of product liability issues. Fortunately, its relatively easy to do. However, we strongly advise getting a qualified electrician to do it for you (it should take only a few minutes to wire each one). We can get all of these components for you, or advise you where to get them. Please email us. - 20 by 50 litre kegs. 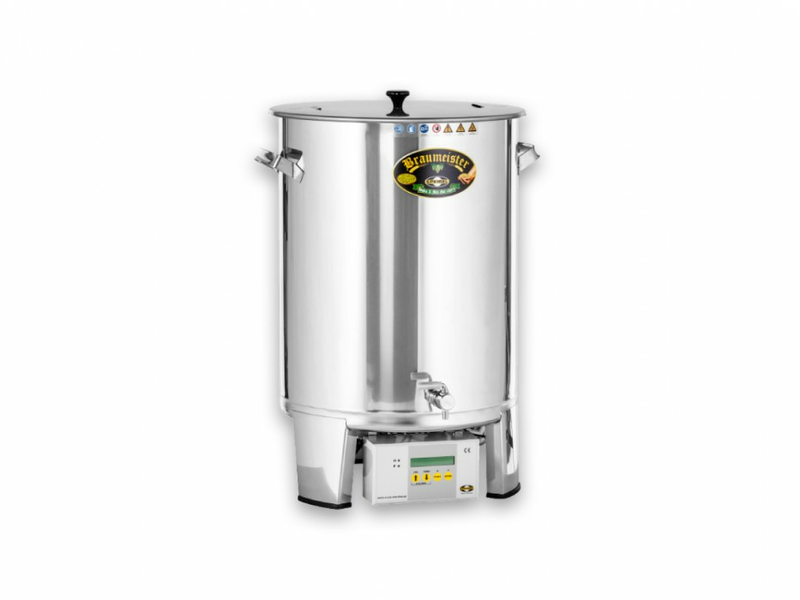 Alternatively, 30 litre disposable kegs are becoming more and more popular with microbreweries. If you intend to open a pub/restaurant, then you will also need dispensing taps, CO2 etc. We can get all of these for you, or advise you where to get them. Please email us. Cleaning: Skip this, because its not feasible at low volumes. In Ireland, use new bottles. Capping: Use a top quality counter top capper. Automated systems cost many tens of thousands of euros, and are not feasible at this volume. Labeling: The simplest solution is to use self adhesive labels. And place them manually since the cost of automated systems is not feasible at this volume. Tank conditioned: A pressurized tank conditioned solution (sediment free bottles) is possible by simply chilling the kegs above to 2 oC and then using a Bottle filler BEERGUN with accessory kit. A trained operator can bottle 15 bottles per minute, or 900 per hour. However, this requires lots of kegs, and a cold room. Also bear in mind that if you become successful, and wish to scale up, then the cost of large pressurized tanks and counter pressure filling systems is high. Bottle conditioned: This solution already includes 2 bottling buckets, complete with filling sticks. So you won't need any additional equipment. Lifting the malt pipe from a 50 litre brew is not simple, and many customers make their own pulley systems to make this job easier. However, you need to be careful because the wort is normally at 78 oC when removing the malt pipe so it can cause burns if it falls back into the boiler and splashes hot liquid around. We are not qualified or able to advise on this, you may need to seek specialist advice. If you place the Braumeister on a standard height bench, and place the fermenter on a stool, and the bottling buckets on the floor, then the max weight you should have to lift is circa 27 Kg. Same with 20 litre kegs; if you decide to use 50 litre kegs, you may need to invest in trollies and other handling equipment in order to comply with safety regulations. We are not qualified or able to advise on this, you will need to seek specialist advice.